The Commanches released this record in Britain on Pye 7N 25609 in February 1964 and it somehow managed to get a release in America on Hickory. By '64 The Beatles had conquered our old colony and Hickory Records must have been keen on some of that merseybeat action because they also released singles by The Overlanders. The A-Side 'Tomorrow' is very much tepid merseybeat, the singer has a crooning style similar to Elvis. Quite boring stuff actually. 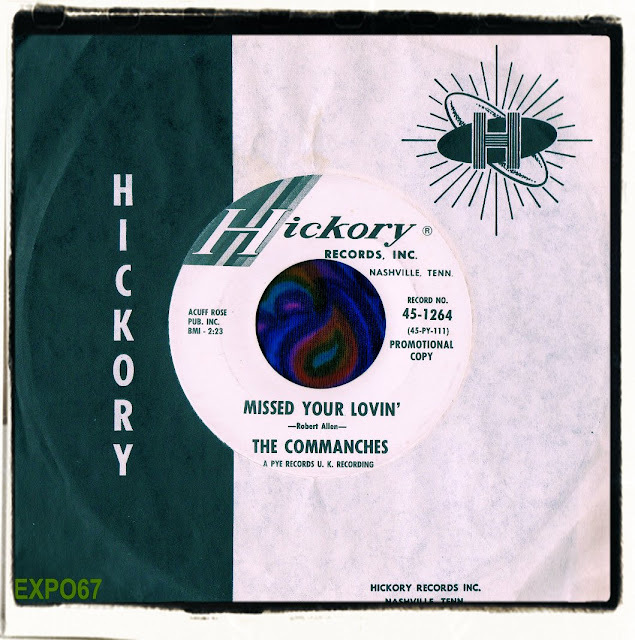 The Commanches had previously backed singer Bobby Allen on a 1964 Fontana single titled 'Half As Much As You'/'So In Love With You' but stepped out on their own with this 45. Curiously 'Missed Your Lovin' was written by Bobby Allen.